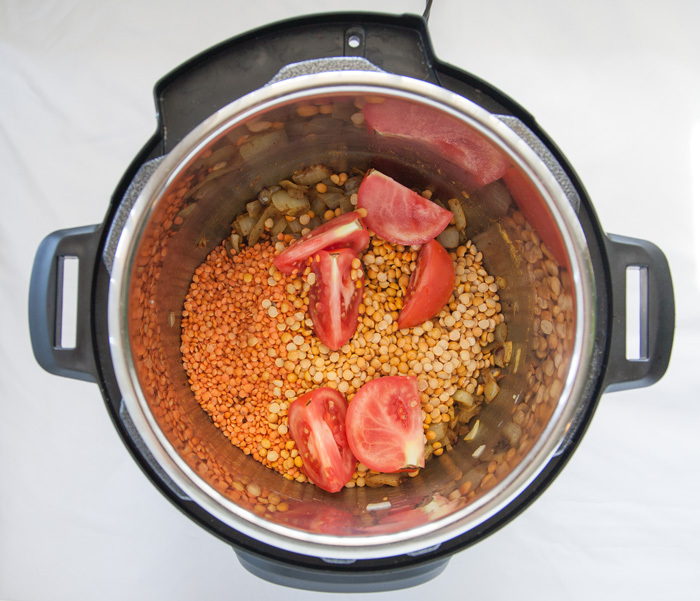 There’s a lot to love about this dal already, but there’s one more thing that takes it to the next level: Instant Pot! My faithful pressure-cooking companion has made this procedure another notch simpler, and I just had to get this on paper for my fellow devotees. Follow the original technique if you’d rather cook on the stovetop, but this is my method now! When I used to follow the original recipe, I would cook the lentils first and make a spicy sauteed onion tadka to stir in at the end. Now, I take advantage of Instant Pot’s Saute function to cook those ingredients first before adding the lentils to the same pot (the actual legume-cooking-time is so much quicker under pressure, that I no longer find it worth it to cook the aromatics separately). I don’t know if purists may turn up noses at this technique, but to my tastes the results are perfectly delicious. Today I used an equal mix of red lentils and yellow split peas, but you can also just pick one or the other – they’re similar in texture and flavor. Just don’t use hardier lentils like brown, green or black, because those won’t break down into a smooth consistency like these will. After stirring in the water, this mixture cooks under pressure for 10 minutes. It doesn’t look so pretty when we open the lid, but don’t fret. Take this opportunity to easily pick out the slivers of tomato skin, and then the dal is easily whisked to a smooth, almost-puree consistency. You could stop with just the perfectly spicy, tomato-infused lentils, but on the other hand… why not add a TON of spinach?!? The delicate leaves wilt right in, and add so much extra nutrition. You can even add more than this if you like, go nuts! I use fresh when I have it, but I also keep frozen spinach on hand for this. 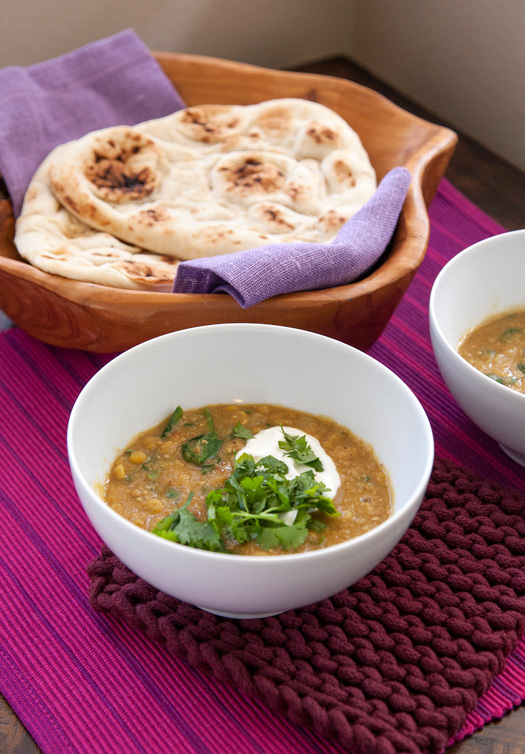 To make this a full meal, I top with a generous dollop of cold, plain yogurt and lots of fresh cilantro, then serve the dal with a side of whole grain rice or naan. 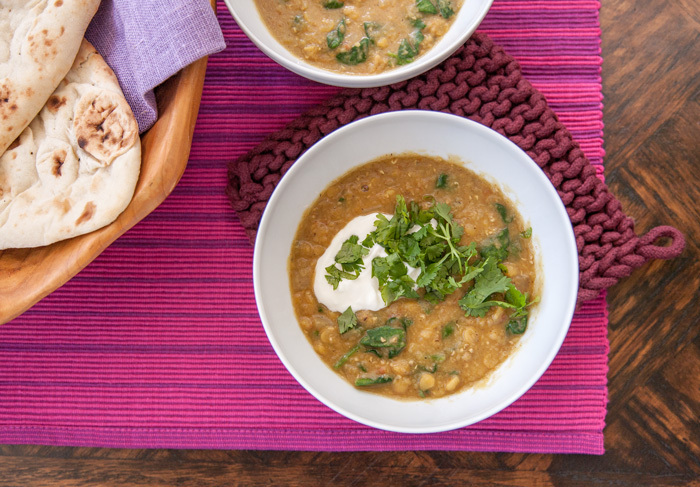 It’s really hard for me to do justice to how delicious this is… it doesn’t seem so exciting because it’s a bowl of stewed lentils, vegetables and greens – not to mention peasant food – but I’m honestly always happy to sit down to a bowl of this dal. Those unassuming ingredients come together into something unexpectedly rich, savory, spicy and satisfying. Trust me… it’s a keeper! FIND MORE OF MY INSTANT POT RECIPES HERE. Add the coconut or olive oil to the pressure cooker to cook over medium heat (press the 'Saute' button to begin cooking at medium saute heat). When the oil is hot, add the chopped onions and cook until they soften and become translucent. Stir in the garlic, and cook for another minute until fragrant. Turn off the heat (hit the 'Cancel' button), then add the cumin, coriander, turmeric and cayenne and mix well to combine. Add the lentils, water, salt and tomato wedges and stir into the onion mixture. Cover the Instant Pot with the lid, and be sure that the valve is in sealed position. Press the 'Manual' button and adjust cooking time to 10 minutes. After the program is finished, press 'Cancel' to turn off warming mode, and wait 10 minutes before opening the valve to release pressure. Remove and discard the tomato skins, and whisk together the lentils to emulsify, smashing the tomato wedges against the side of the pot if needed. Add the spinach, along with cilantro and/or butter if desired, and stir to combine. The residual heat will wilt the spinach quickly. Serve over brown rice or with naan, topped with plain yogurt and fresh cilantro. i’m an Indian who’s cooked Dal for years in the traditional way. Came here to check the cooking time for instant pot. Love the idea of putting in the seasoning before hand and be ready to eat the Dal at end of it all. Thanks! Thank you!! I know my shortcut isn’t the most authentic, but I’m glad you think it works too! Great insta-dinner is right! WE do beans a lot in my family. 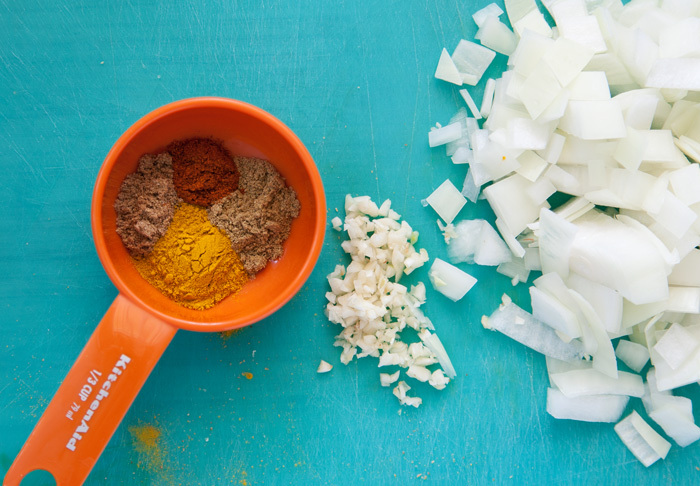 But not lentils…gotta get some to make this delish-looking dish! I did it!! Thank you SO much!! This was just what I needed. The photos were so helpful. I kept making the yellow split peas and they kept coming out like one of your photos. ..I had no idea I needed to whisk it! I can now use my instantpot! Can you tell how I could make the split peas in a way that it cones out with the peas still there – not mushed? Having a bowl of your recipe now- yummy! I think split peas and red lentils always cook up to a mushy consistency, but if you’re looking for more definition, I would try cooking brown, green or black lentils – they hold their shapes much better. Thank goodness!!! When I saw they were mushy, I thought I did something wrong!! You need to use whole yellow peas. they will take longer to cook though. I’m glad it’s been a hit! Such a humble recipe, but always so satisfying. Do you soak the lentils/peas? Nope, not for this recipe! This is my 2nd attempt at Instant Pot cooking and it was a success! I served it with plain yogurt, lime wedges, and naan. Delicious! Thank you for sharing! Finally a good Dahl recipe for my instant pot. After making the regular way for years I too wondered of a one step ready to serve method! Following you on Pinterest now. Can I add the spinach in the same time with the Lentils? How would the spinach cook if it’s just added in the end? The lentils are very hot after pressure cooking, so the spinach wilts quickly when stirred in. This is baby spinach, so it’s delicate and doesn’t have very thick stems. 10 minutes under high pressure would leave it pretty overcooked for my taste. It’s worth a try leaving out the tomato – you could try adding another vegetable for flavor, maybe a squash puree? So easy and delicious! And healthy! Thanks for sharing this awesome recipe! This is excellent! I love my Instant Pot…my sister was coming over for lunch and she said “the aroma” of everything cooking. Yes, I said, and ready in 10 minutes! What a great lunch we had. Thank you, thank you, thank you! You made our time together special! Thank you for sharing, this is so charming! I love when simple foods meet special moments – nothing better than sharing a good meal! Awesome recipe. Thanks for the guidance on using the instant lot as well. Made this last night and loved it! I used 1/4 can of canned tomatoes instead of fresh. 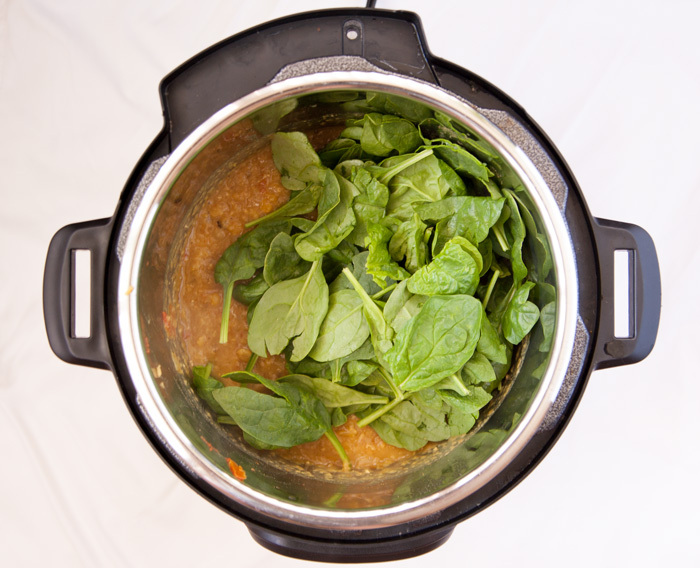 what is an instant pot ? Is it the same thing as slow cooker ? It is a brand of electric pressure cooker – it does have a slow cook function, but this recipe is written to cook under pressure. Can you use frozen spinach instead of fresh. If so, when and how long to cook? Yes! I use frozen cut-leaf spinach sometimes. Stir it into the hot lentils after cooking just like the fresh spinach; it heats through quickly, and even helps cool the soup a bit. I don’t bother thawing first and squeezing out the liquid like in some other recipes – this dal can accommodate the extra moisture. This looks good, but I have questions for Instant Pot experts. If I halve the recipe, would the Instant Pot get upset? Would the time remain the same? Should be A-OK! With Instant Pot, the general rule is to always cook with a minimum of 1 cup liquid. But be aware: this stuff makes great leftovers, and can even be frozen. Thank you for this great recipe, I just got my instant pot and this is my first try, I am so happy I can now cook easily and quickly lentils and beans! Yes, Instant Pot makes dry beans SO easy! I love being able to “set and forget” and this is a great recipe to freeze for later. You should be able to use the same cooking time regardless of the quantity! Have you tried adding cubed potatoes to this? I’ve made it once before (it was delicious) and I want to try adding potatoes next time. 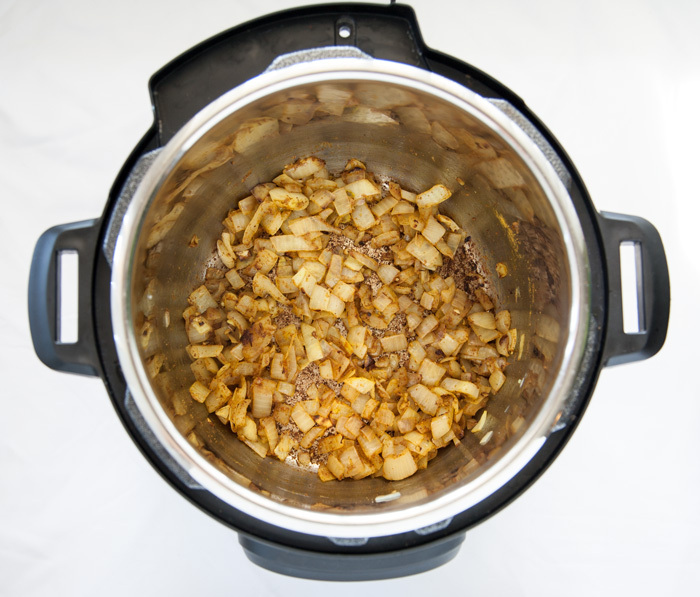 ‘m new to pressure cooking, would it require changing the amount of liquid? Good question. If I tried it, I would probably add a little extra water to keep it from getting too much thicker. Maybe start with 1/2 cup of water for every cup of cubed potatoes you add? Just a guess. Than for the recipe! Do you know if you can add meat to this as well ? If so at what point would it be added? I had never heard of dal with meat, but apparently it can be done! 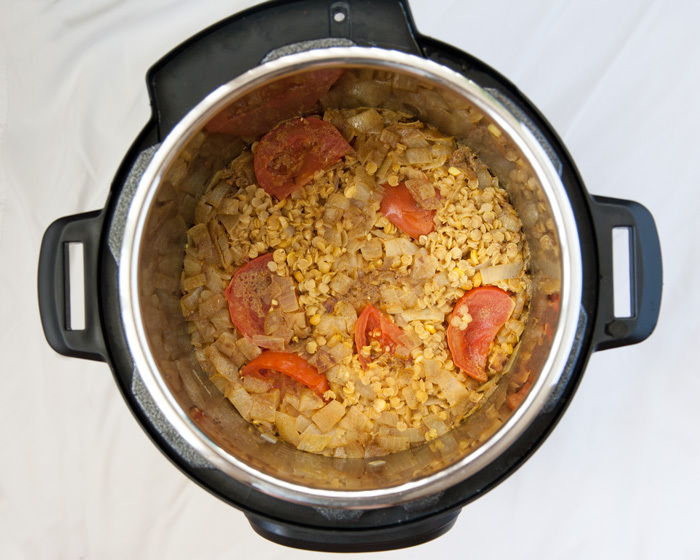 Here is an interesting article I came across with a recipe you may find useful: The odd couple: how to cook meat with dal. Just made this tonight (after I saw it recommended by someone on metafilter)! It turned out perfectly! I served with some naan from a recipe on budgetbytes.com. I’m gonna check out your other instant pot recipes now! A friend suggested adding a teaspoon of brown mustard seed to the oil at the very beginning and then waiting until it starts popping like crazy before adding the onion. This added a nice flavor. Along with the onion I added a finely diced jalapeno (I like it hot) and some leek. After adding the garlic and sauteeing it a minute, I added the spices (I used 3 TBs Sun Madras Curry Powder with some smoked paprika and just a bit of cayenne) and sauteed those around a bit to develop their flavors. The spices will stick a bit, but then I added a little bit of the water and degazed the pan. I used canned diced tomatoes and it did not see to hurt the flavor at all. Adding the fresh spinach at the end really does make this extra special; I may never use frozen spinach in dal again. With rice this fed two of us well and we have another meal’s worth left over. Sounds great! I love this with jalapeno too. I want to use brown lentils. Should I increase the cook time? Thank you!! I haven’t tried brown lentils – they don’t break down the same way as the ones I use, but if you’re looking for whole lentils with more of a “bite” you can probably use the same cooking time. You can always slow-cook or pressure-cook for another couple minutes if needed. This is FANTASTIC! I happened to use some homemade bone broth because I was wanting to get it used and it detracted not at all from the recipe. GREAT way to use up things often on hand at this house. The taste is simply wonderful. I will do this again and again. This smitten kitchen recipe is one of my very favorites–I make it all the time. I am delighted about this instant pot conversion. Thank you so much! This is such a great recipe for the Instant Pot. We tried this the other day and had dinner in under 30 min. The only thing I would change is to saute the garlic and spices separately and whisk them in at the end. Pressure cookers really dull spice flavors and I’ve heard you often have to double or triple them if you’re adapting a stovetop recipe. We are also loving the Creamy Coconut Oats recipe and will be trying your Chocolate Chili recipe for the Instant Pot next. So excited to have found your blog. It’s hard to find recipes that are quick, nutritionally dense, and delicious too. Thank you! I recently bought an Instant Pot and have been testing different recipes from the internet. I Made this today with the 1/2 red 1/2 yellow lentils as suggested. I didn’t bother removing the tomato skins as they were so soft and tasted fine to me. Overall a wonderful recipe. I like the idea of adding the jalapeno as mentioned previously to give a bit more heat and will definitely try that next time. We purchased the package of small toaster size naan from Costco this week and it was perfect with this dish. I used beet tops as I was out of spinach and found this to be very delicious as a substitute. Great recipe! So amazing! I experimented and added half a bag of riced cauliflower veggie medley (I figured carrots, peas and cauliflower show up in most Indian restaurants I’ve been to) and its so good! Added at the beginning they cook down to be almost undetectable (can see a few carrot and pea pieces) Or add at end with spinach for a bit more texture. More veggies are always a win in my book! What a great idea, that sounds delicious! Do the lentils need to be soaked before cooking? No need to soak, you can use them dry. I love my instant pot and this recipe is delicious. I had to put mine back in for another 10 minutes though. I followed the instructions, but used yellow lentils and they were too hard still after 10 minutes of cooking and 10 minutes of sitting. How do I double this recipe in the instant pot? Do I truly just double all the ingredients? Is 6 c. liquid going to be too much? We love this recipe so much we want to make a giant batch of it! hope that helps, glad you like the recipe! Awesome recipe–the first one I made in my new Instant Pot. It’s the best dal I’ve made and also the easiest. Thanks so much! Is it supposed to cook on high pressure? I’m new to this and half way through cooking I realized that it was on low pressure since that is the default setting. What do you do? Thanks! I’m not sure about newer models, but my IP-DUO60 runs high pressure by default. If low pressure is selected, the lentils may not be tender enough after cooking. You can always continue to cook after you open the lid if needed – even just switching to slow cook (for a simmer) or saute (for a more powerful boil) instead of more pressure-cooking time. Thank you so much for giving such detailed instructions on how to use the instant pot. I just got one, and I am a little afraid to use it. I will make this as my first recipe! Never fear!! The most important safety things are to always use enough liquid (at least 1 cup), and to let full pots (especially starchy foods like rice or beans) settle for a few minutes before you release any pressure. Otherwise, it’s real easy to stay safe with this thing! Happy cooking! I was scared too when I got mine. But I only use IP recipes that explain step-by-step what functions to use and when to use them during the prep of the recipe. That really gives me confidence and releases me from the anxiety of wondering what to do next and whether I’m making a mistake or pushing the wrong button, or having to guess at how long something takes. Since I’m free of this anxiety I can enjoy preparing the meals and they come out wonderfully. Going into preparation with good intentions and a bright outlook really has a wonderful impact on the outcome of the meal. Likewise, fear and anxiety have a negative impact. Delicious!!! Thank you for this recipe. I’ll make it often! I found this recipe by way of a google search on “recipes for yellow split pea soups”. I needed a recipe that didn’t call for any meat because I didn’t have any at the moment. So I landed on your link and I love this recipe — simple, easily accessible ingredients that typically live in my kitchen anyway, and I LOVE the addition of spinach and butter. So I made it and (I’m eating it as I type!) it’s PERFECTION. Thank you so much for this! I’m thrilled. BTW, I don’t like strong spices so I used half the amount of cumin and coriander, and just a pinch or two of cayenne. I didn’t have any tomatoes but I had some tomato paste, so I used about 3 tablespoons of that. Other than these slight changes I stuck to the recipe — oh, one more thing: I used a mix of yellow peas and red lentils because I love both and I have both in my cupboard. I highly recommend mixing these because they cook just the same and taste practically the same but each as unique nutritional value. Thanks! I agree about yellow peas with red lentils – they really compliment each other and make a better soup together! Had to open a 28 ounce can for a recipe but didn’t use all of the tomatoes. Thank you! Yes, those will work nicely! I got the 3 quart pot for Christmas, and this is going to be the first recipe I try. One question. Will the quantities work for the 3 quart pot, or do I need to scale back? I went ahead and made the full recipe. The ingredients came exactly to the 1/2 mark. Turned out excellent! Oh fantastic! Thanks for reporting back, that will be helpful for people! Hi! Just tried to make this dish but struggled with my Instant Pot coming up with the “burn” warning before it could finish! I am wondering if you/anyone has had a similar problem. I wondered if maybe it was because the sautéing left something on the bottom, but we emptied the pot, cleaned it, and put it all back in with extra water and it happened again! Any suggestions would be appreciated. Thanks! I’ve gotten the “Ovht” (overheat) error when cooking other things that didn’t end up having enough liquid (once ground turkey without enough broth, and once steel cut oats with extra pumpkin puree). I’ve never had it happen with this dal, but maybe your lentils are extra absorbent? Really enjoyed the recipe. Made one small mistake used 1 tsp of the Cayenne. Worked out great as I love the flavor. Will do this again soon. Fascinating to think in American culture it would be similar to soup and salad in one. Really terrific recipe – we loved this dish. This recipe is so easy and tastes delicious. It will be a staple in my house now! This is such a quick recipe but its oh-so delicious, i make double and box it up for lunches for me and my husband during the week, seved with brown rice its a nutritious vegan lunch and the lentils keep me full all afternoon. So easy and so tasty! I found the flavour a little weak so now I double the cumin, coriander and turmeric, and do just a little extra cayenne. Also did 2 cups water and 1 veggie broth. Perfect! I eat it with brown rice, mango chutney and chili garlic sauce. I love curry but some recipes are so intimidating. This fills my curry void and has become one of my favourite meals, thank you! SImply fantastic! Great recipe and so easy to make. Great taste and sure fills my dal desires. Thank you for your clear recipe with photos – am still getting used to my instant pot but this easy recipe helps build confidence! Instead of spinach, can I use broccoli or another vegetable? My husband cannot eat spinach. I think it would work well with other greens like kale or collards, simmered at the end just long enough to become tender. Broccoli might work too, but maybe a little trickier to get it cooked just right! My husband can’t have any leafy greens, so those will not work. Any suggestions? This was my first more complex instant pot dish than beans or steamed vegetables. I expected it would go wrong but amazingly it worked perfectly. The tomato skins were easy to pick out and a little stirring with a wooden spoon brought this to an ideal consistency. I ate it on top of Whole Foods super grain mixture, quinoa, buckwheat and millet, which was a good match. My only future change will be more spice, I need some fire. If I chop up some chili peppers, should those go in with garlic or spices or tomatoes? I am vegetarian verging on vegan and this is my kind of food. This will be a regular dish for me, both easy and full of plant nutrition. I’m with you, in the years since I posted I’ve kept making it with more and more fire. I add minced jalapenos or whatever other chilis I have at the same time as the garlic. Thanks for your comment, enjoy!